Our Ambassadors at Busch Gardens Williamsburg and Water Country USA have the awesome responsibility of caring for our guests and each other every day. Calling on the strengths of service and unparalleled kindness, our ambassadors help create inspiring memories that last a lifetime. So come join our team and love what you do. We want to give you the opportunity to shine with us. On I-64, take Exit 243 towards Busch Gardens. Follow the exit ramp to route 60 (do NOT follow to the park main entrance). 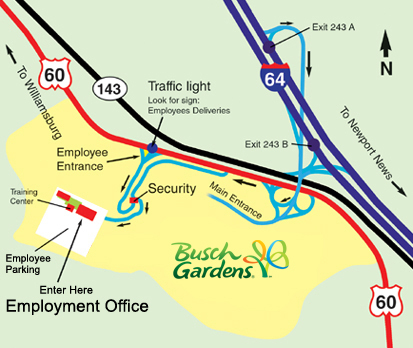 Turn left at the light onto route 60 and follow the Employee Entrance and Deliveries signs for Busch Gardens. Please inform the security ambassador that you are going to the employment office. The ambassador will need to see a photo ID and record your car license plate number. You will turn right immediately after the security checkpoint and follow the road around. There will be a two story building on the right. The employment office is located on the lower floor.